Emanuela Slanzi was born in 1955, in Vermiglio (Trento), Italy. She settled down in the Netherlands in 1980. In that same year she was admitted to the Rietveld Academy in Amsterdam. She continued her study at the Academy for Arts in Utrecht (HKU). 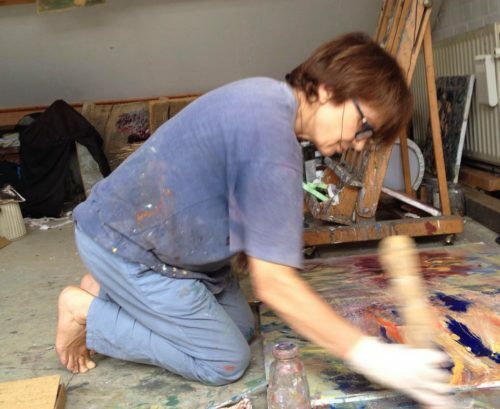 She has exhibited her works solo and in groups in the Netherlands, Belgium, Italy and Bosnia. In 1995 she attended the Didactical Pedagogical Education for Artists, to enable her to teach. She gave lessons at several creative centers. She gave a ‘special’ series of lessons to prisoners at the prison in Breda: The project ‘The butterfly and the cocoon’. Emanuela has developed and adapted a programme for the Islamic primary school in Breda, paying special attention to culture. She taught at the Graphic High School in Rotterdam between 2001 and 2002. 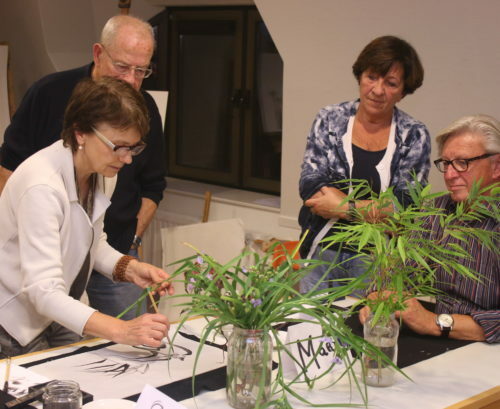 Since this time, Emanuela has been giving courses on Sumi-e and other painting techniques at the School voor de kunsten Roosendaal. Of all her exhibitions the most important are: A solo exhibition in Forte Strino, Italy; a fortress in the Alps which played a significant role in the first world war, and a group exhibition later on in Sarajevo, Bosnia. Both exhibitions bear witness to a social and political involvement, on addition to her life’s story and her childhood. I experience painting as creation of a new inner space. It is a process where I slip between the invisible, internal imagination and the visible, tangible reality. Every painting is a living witness of the long search for a new inner dimension; the result of constant attention to layer upon layer of paint. In contrast to my earlier work, my recent compositions push the attention away from a more personal, story of memories and a connection to the past, towards the freer dimension of a floating spirit. The canvas still contains indications of a more tangible reality. This development paints itself as a journey in my work, a stroll through time, a process of transformation with switchovers from one dimension to another.